Click above for the KAMAD VLOG POST on Swashbuckling films. Let me give appropriate context before you judge me too harshly. If I had seen any of the “Fast and Furious” movies other than the first one, I would have gone to that movie today instead of this. Something about “Epic” just did not look appealing to me, and I love animated features. 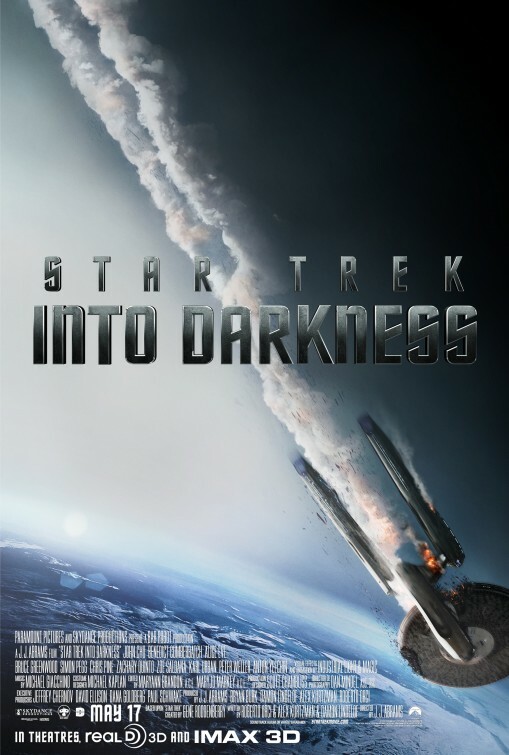 I probably would have enjoyed seeing “Star Trek Into Darkness” again, but I have been twice. My weak reaction to “Iron Man 3” kept me out of that theater. Friday night we re-watched the original “Hangover” and laughed almost as much as we did four years ago. So you now know why, even after the extreme disappointment of the the second “Hangover” film, and the terrible word of mouth on this one, we went anyway. The trailer with the giraffe was encouraging, we had no new films in the local theaters and I needed to be out. So there, shoot me. 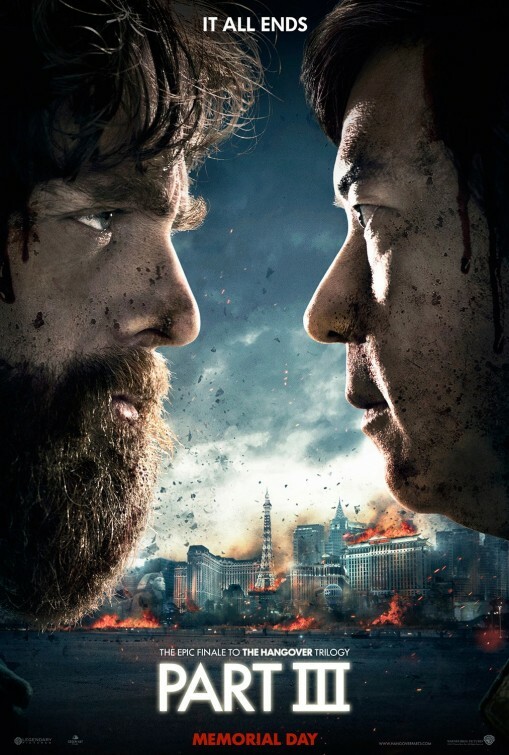 Here is my faint praise for this film, “it’s not as bad as I thought it was going to be.” The three most entertaining parts were two scenes at the beginning and the final credit stinger. I guess I’m a bad person, the giraffe bit worked for me. In part because it is played as a cartoon and the CGI is so obvious that it can’t really be too disturbing. It is the biggest laugh in the movie, it is mostly in the trailer, and you can see the joke coming from a mile away. If you are sick enough to still watch, then you will be amused. It will take almost two more hours before you are similarly entertained by a fresh idea in the movie. This is clearly a money grab and while a bit cynical, it only hurts the willing victims. I thought my chances of being slightly entertained by this were greater than my chance of winning the “Powerball” lottery last week. So I saved seven bucks from buying quick pick numbers and spent it on a matinee. It was a better buy in the long run but not very rewarding none the less. Ken Jeong as Mr. Chow is amusing in small doses, here the dosage seemed to be horse pill sized. Zack Galifinakis went from being an weirdly charming oddball character in the original film, to a loathsome excuse for a human being whom we are supposed to laugh at. Supporting/ensemble characters should remain that way. “Cars 2” is a mess because the focus is on Mater, and “The Hangover III” suffers because the two oddest characters are put front and center of the story. Instead of ordinary guys coping with extraordinary events that they can’t remember, we get a caper film that depends on us laughing at a murdering criminal and a psychotic mess who is off his medications. There are some gags along the way that might have worked in another movie with a different set of characters and a different premise, but they mostly fall flat during this two hours of time spent looking at things on the screen. The things on the screen are not as boring as some movies I’ve witnessed, but they sure are not as amusingly entertaining as the makers of this movie want them to be. I have already spent more time writing about this than I wanted. I almost posted a single word review: “Don’t”. I did want to defend myself a little (yeah I know I encourage the studios to keep doing this stuff by buying a ticket, but I also give food to stray animals and indulge crazy people in conversation, it’s a personal failing). The world will be a little better knowing that we are done with these films, and you will only be a little bit worse if you go and see this. I suggest you find something else, but I won’t judge you if you feel you must add this to your viewing history. I just want you to return the favor. Maybe some one else noticed this before me, I would not be at all surprised. I watched “The Dead Zone” this morning, a movie that I saw in theaters and have seen at least a dozen times since. As I was listening to it, the music was haunting and also strangely familiar. It dawned on me that it was strikingly similar to the music from “The Silence of the Lambs”. 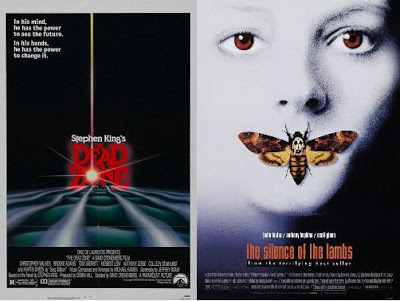 I remembered immediately that “Silence of the Lambs” was scored by Howard Shore but I could not remember (if I ever knew) who had scored “The Dead Zone”. I looked it up on IMDB and the late Michael Kamen turns out to have written this music eight years prior to “The Silence of the Lambs”. I naturally assumed that Shore must have been influenced by Kamen’s work since it preceded his. As I read about Kamen, who scored a dozen movies that I adore including “Die Hard” and “Lethal Weapon”, I also discovered an interesting piece of information about “The Dead Zone”. According to IMDB “His score for The Dead Zone (1983) is an adaptation of, and variation on, a theme from the second movement of the Symphony Nr. 2 in D of Finnish composer Jean Sibelius (1865-1957).” So the tone of the music is derived from an earlier source. I immediately went to look at Howard Shore’s information and found something pretty amazing. The IMDB page writes that “Since 1979, he has scored all but one of director David Cronenberg‘s theatrical films. Cronenberg is also from Toronto, Ontario, Canada.” So it turns out that the one score that was done for a Cronenberg film, was written by a composer who later is echoed himself by Cronenberg’s main composer Howard Shore. The connection of the soundtracks was emphasized a little bit more when on the same page, this tidbit of information turned up: It seems that Shore “Was inspired by Richard Wagner; in particular his Ring of the Nibelung cycle of operas; in composing his scores for the Lord of the Rings films. One exception to this was the Shelob’s Lair scene, in which Peter Jackson told him to “go off and pretend you’re making another movie for David Cronenberg. It is likely that Kamen, was inspired by Sibelius and guided by Cronenberg, who usually worked with Shore, and then Shore was inspired by Kamen’s work, created the “Silence Theme”, and is later referred back to his Cronenberg work by another director. I love the way the creative process works here and I salute all of these artists on achievements that move us emotionally and intellectually. I have written on a number of films over the last couple of years that I really will never see again. There are the new blockbuster releases that are good for the weekend but don’t leave a mark. There are the usual horror films that don’t scare and leave you wanting more. And finally there are the films I looked forward to that disappoint and which will stay at best a vague memory as time goes by. When I first started blogging, the films that I wrote about were from the 1970s and many of them are old friends that I visit with and treasure on a regular basis. 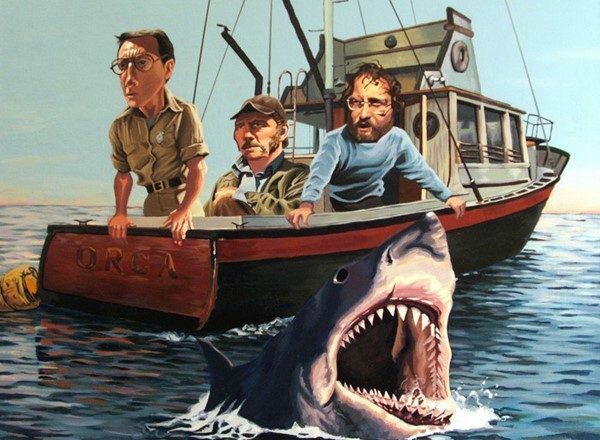 The closest of those old friends has been the Spielberg Classic “Jaws”. I have a half dozen posts on it at this point so it is pretty clear how much I love that movie. Yet in spite of my admiration for that groundbreaking mid 70s classic, it is only my second favorite film of all time. You see I am in love with someone older. In fact, this month my object of adoration turns 75. My favorite movie ever, came out twenty years before I was born, but it looks as good now as it did in 1938. It is far more entertaining than most of the films being made today, and it has a cast that puts most of today’s stars and supporting players to shame. It was not until I was in my teen years that I remember seeing the film on television and in color. That is when my love affair really began. Some time in the mid 1970s, I went to a screening at the Rialto Theater in South Pasadena. 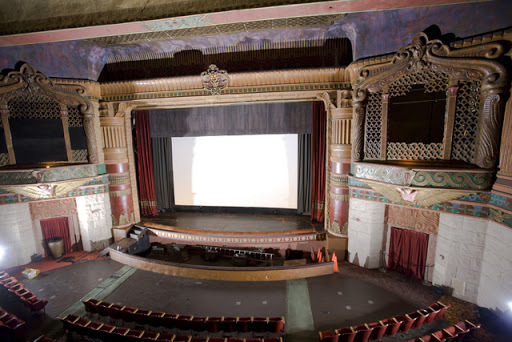 This theater was a neighborhood movie palace from the old days, with ornate wall carvings and a balcony. A few years earlier it was converted into a revival house and old films as well as unusual fare were programmed into the theater. I think my Dad and I went and saw “The Sea Hawk” which was in black and white and “The Adventures of Robin Hood” in color, on the same night. Here is a video tracing the history of the Rialto Theater. 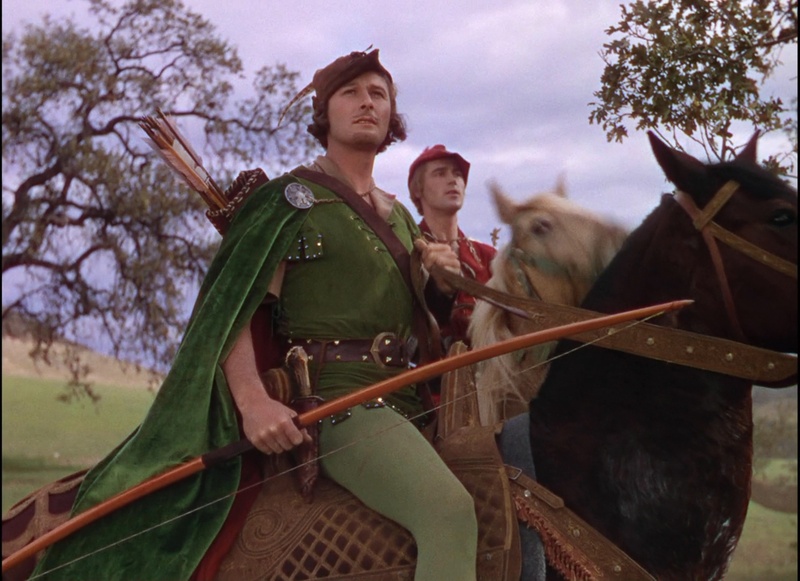 If you look at it, you will see how easy it would be for someone to envision themselves seeing Robin Hood for the first time in 1938, even if it was 1976. If you don’t have time for the video, look at this image and try to imagine seeing The Adventures of Robin Hood in these surroundings. I am a romantic at heart and the combination of the film with the setting almost certainly imprinted on me in a way that contributed to it becoming my favorite film. Swashbucklers are films focused on swaggering adventurers and clearly Errol Flynn was made for this role. He had already done “Captain Blood” and his star was on the rise. James Cagney was originally scheduled to play the part but a dispute with Warner Brothers put him out of the film and moved Flynn in. Thank goodness, because as much as I admire Jimmy Cagney, I can’t see him as Robin. Everyone who fell in love with Han Solo in Star Wars, should look at this movie and see where most of the character was cribbed from. Harrison Ford made his career playing parts that thirty or forty years earlier would have belonged to Flynn. The thrill I felt at seeing Luke and Leia swing across the chasm while pursed by stormtroopers in the first trailer for Star Wars, was exactly how I felt when Robin climbs the gate rope escaping the hangman, or swoops into the frame to greet the prisoners in the attack in Sherwood Forest. The movie succeeds on so many levels that it is astonishing. Let me see if I can organize my enthusiasm a little for this discussion. I want to focus first on the characters as performed by the stars, and then discuss the story. When I finish with the main course, then we can take in the dessert that is the score and photography of the movie. 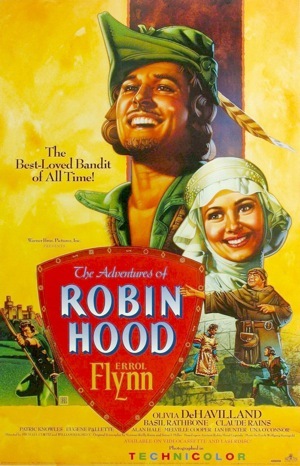 Robin Hood, as portrayed by Flynn, is the very definition of a swashbuckling character. He is indifferent to risks and seeks adventure by challenging the injustices inflicted on England by an illegitimate ruler. Flynn gets three or four great entrance moments in the film. When we first see him, his horse bounds over a hedge and pulls up in time to rescue the desperate Much, the Millers son. His confronting of the diabolical Guy of Gisbourne, sets the tone for serious drama leavened with a scoundrel’s humor. He is clearly established as a good hearted man who is offended by the casual injustices he sees popping up around him. He could stay detached and as Marion says at one point “live in comfort” but that is not his way. Backing off from conflict is not his way either. He invites it by taking the poached deer that was to doom Much, and delivers it in grand style to Gisbourne and Prince John. He swaggers into a feast filled with enemies making plans to put John on the throne, and pushes their soldiers out of the way with the antlers of the deer slung over his shoulders. He presents it as a gift from the King he remains loyal to, in a direct slap in the face to the barons gathered to depose him. This second introduction sets up his willingness to defy the odds and his impudent character. He trades jibes with Prince John and Sir Guy, he mocks the Barons with his tone of voice and manner, and he begins the serious flirtation that will be the center love story that pulls us all more deeply into the adventure. As he makes an escape later in the scene, we see his skill as a archer and his ability to improvise in a clever way by turning the gatekeepers into his allies. This is clearly a man who is able to stay above water using his wits and skills. It will take a cunning enemy to bring him down, and it is never clear that anyone on the other side will be able to match his wits in these confrontations. We know the depths of greed and ambition running in the Norman plot, it is their determination and ruthlessness that are Robin’s biggest enemies, not their cleverness. Robin’s third great entrance is his appearance in Sherwood to end the attack on the caravan carrying the “ransom” money collected by Gisbourne’s troops. Swinging out of the trees as if from nowhere he magically lands on a prominent rock and announces his welcome to the defeated enemy, who were accompanied by Maid Marion. Each time Flynn steps up in front of his enemies, he does so in a manner designed to tweak them and flaunt his indifference to their animus. This is the key ingredient to a true swashbuckler, that and swordfighting. (More on this later). It is often said that a great action film is only as good as the villain that stands in the way of our hero and ultimate success. 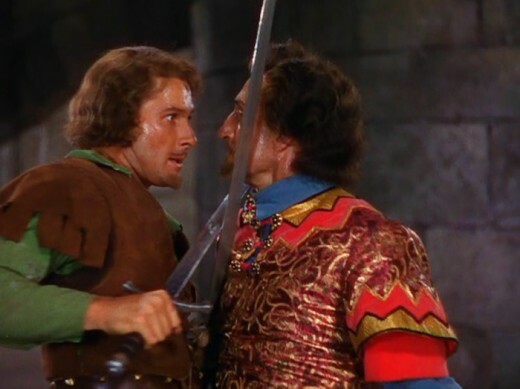 “The Adventures of Robin Hood ” has a plethora of villains, and the tandem of Guy of Gisbourne and Prince John is impossible to match. Gisbourne is the blunt instrument of John’s plans, and an ardent foe of Robin since he covets Marion for himself. Sir Guy is played by the amazing Basil Rathbone, the elegant and lean faced intellectual best known for embodying Sherlock Holmes in a series of films in the 1930s and 40s. 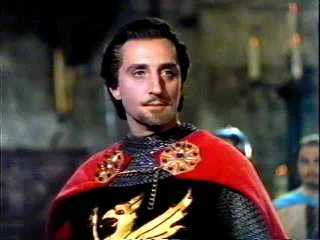 Rathbone was a Shakespearean actor who was not new to swashbuckling adventures. He had already battled and lost to Flynn in Captain Blood, in a memorable sword fight on a beach. It has been said that Rathbone was the best fencer of all the Hollywood community. Given the number of times that swords were involved in his films it is not really hard to believe. Rathbone was also an accomplished film actor with two Academy award nominations to his name. His intense eyes and hawk like visage would be sure to frighten small children and make him an intimidating foe for our hero. The character of Sir Guy is a metamorphosis from the legends where he was a bounty hunter working for the sheriff. In this film he is a nobleman, conspiring with the Prince to seize the throne. Rathbone trades barbs with Flynn’s Robin throughout the film, right up to the climactic sword duel that rightly remains legendary today. A single foe would not be enough to challenge Robin however, even one as evil and dangerous as Guy of Gisbourne. In the larger battle for England, outside of Sherwood Forest and his love of Marion, Robin must also stand off against the heir to the kingdom and a man trying to depose his brother, Prince John. 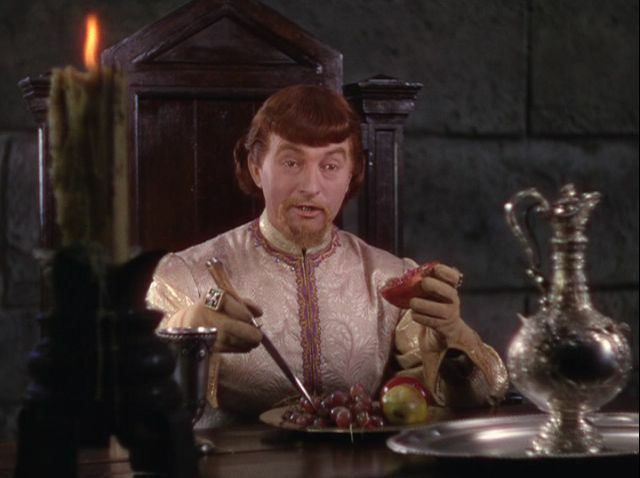 The man who would be king is played by Claude Rains, another fantastic actor who worked in the golden age of Hollywood as a star, as a character actor and as just about the best thing in nearly every movie he appeared in (and some that he disappeared in-“Invisible Man” joke). 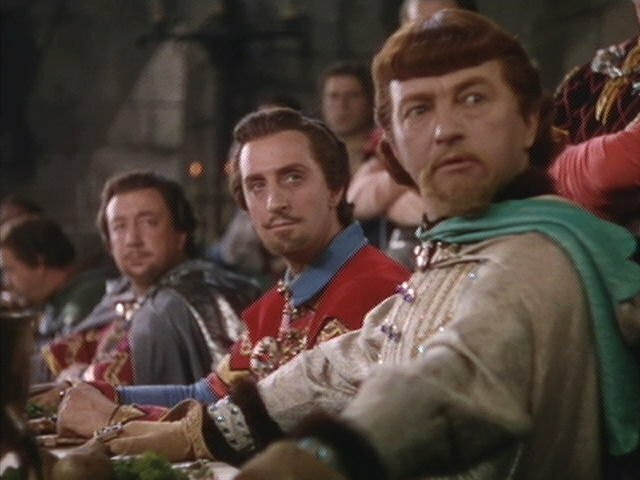 Rains was not a tall man but he exudes confidence and power in the role of Prince John. The stature may also have communicated his neediness to supplant his brother, like an early Napoleon complex. John is arrogant and self assured, at least until Richard returns. Even as Robin is reeking havoc in the countryside, John never seems over his head, rather his intensity simply grows. This shot, showing him picking out the juicy seeds of a pomegranate, is a sly reference to his plans to pick the country dry of taxes. All in the name of his brother but actually to buy his way to the throne. The effete and diminishing tone of voice that Rains uses to convey the character is a perfect counterpoint to the ebullient open naivete of Robin of Locksley. As they engage in the witty exposition at the feast Robin barges into, John openly admits that he likes Robin. He admires his audacity, a characteristic he and Robin share. This exchange is one of the earliest examples of the action hero and the evil villain, exchanging barbs and sharing exposition. Characters in movies today, still try to emulate the feeling of these scenes. John Maclane and Hans Gruber are descendants of this very byplay. In most Robin Hood legends, the Sheriff of Nottingham is the main antagonist. Robert Shaw faced off against Sean Connery a second time in “Robin and Marion”, and his Sheriff fits more closely the character from legend than the ineffectual but sly Melville Cooper. Cooper is largely played for laughs and portrays the Sheriff as a near cowardly shadow of the larger Gisbourne. He is awkward but also clever. It is he who contrives the archery tournament used to snag Robin. 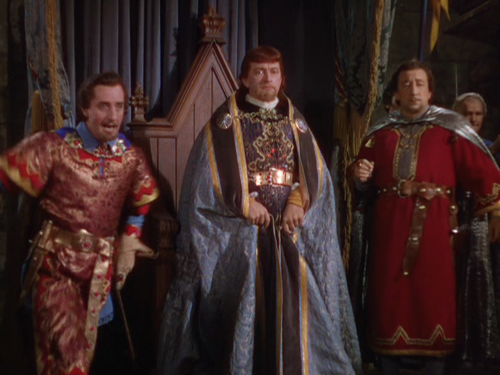 Most of the time he stays in the background, waiting to say just the wrong thing to irritate Sir Guy or Prince John. His plea for mercy and understanding at the end of the film on behalf of John is a great summary of his role, he is an echo existing for comic effect. The legends of Robin Hood are filled with other characters that add color and drama to the tales. The men of Sherwood Forest comprise a guerrilla army, living off the land of the forest and taking plunder not for themselves but to right the injustices of the world. Robin begins the film in the company of Will Scarlet, but despite being the oldest of his friends, Will’s character seems to diminish with the passage of the story. Once other members of his band begin to form, Will is only heard from occasionally. The personalities of the other actors may dwarf poor Patrick Knowles who played him. Early on they save Much the Miller’s son from Sir Guy and he becomes the most loyal member of Robin’s merry men. Much works as both fierce attack dog for the group but also for comic relief. 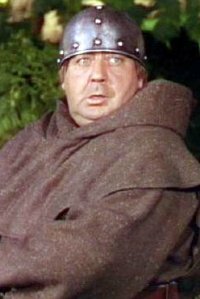 He dispatches the assassin sent to kill the king, and he woos Bess, the chaperone to Maid Marion.In the final battle, he gets the laughs.Herbert Mundin is a familiar presence from many English based films of the 1930s. He also worked with Una O’Conner in a couple of other films where they portrayed a couple. 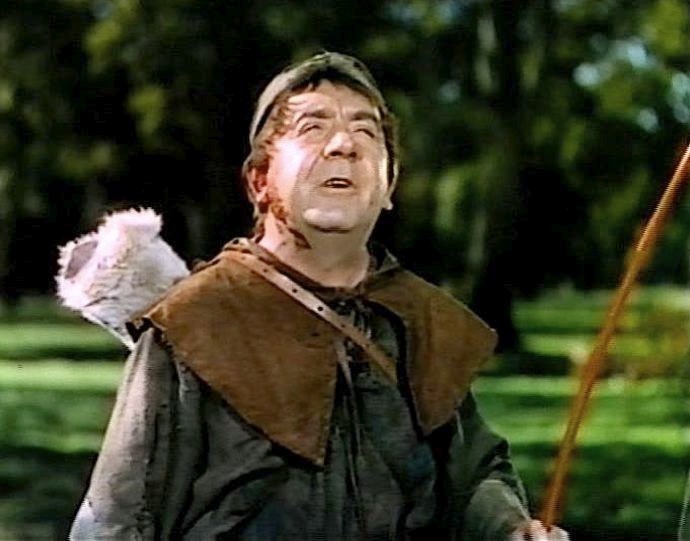 The most prominent member of Robin’s merry men is Little John. So named because he is no such thing. 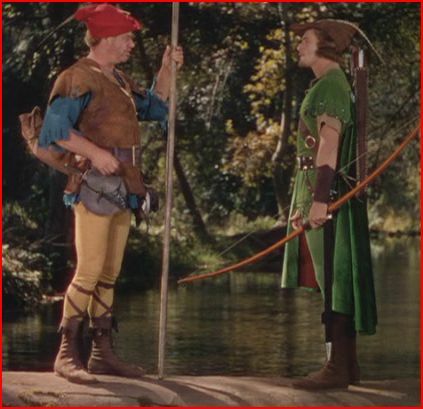 The story of Robin meeting John and being bested by him with a quarterstaff stems from the early legends, so it is natural that it appears in just about every version of Robin Hood you can name. Little John is the muscle of the band, he is large and large hearted and here he is portrayed by Alan Hale (The Skipper’s Dad). He worked alongside Flynn in more than a half dozen other films and the two seem to have a natural chemistry. Where Flynn is sophisticated, Hale is boisterous. Little John is Robin’s sounding board and at times his Jimminy Cricket. Of course Robin disregards his inner voice on a regular basis because that’s what swashbucklers do. Hale strikes me as a cowboy type and so it makes sense that he appears in the westerns that Flynn did as well. The biggest if not the tallest of the merry men is Friar Tuck. Eugene Pallette was a very recognizable Hollywood fixture. He is in dozens of classic films from the 30s and 40s. As far as I could tell, this is the one time that he worked with Flynn. Friar Tuck is a swordsman partial to ale and good food. The scene where he carries Robin across the stream and tosses him in comes from some of the more recent legends. Pallete’s froggy voice and girth were used primarily as comic foil to Little John in the picture. He does present a formidable opponent in the last sequence as well. He also represents a rarely listened to voice of reason in the outlaw group. 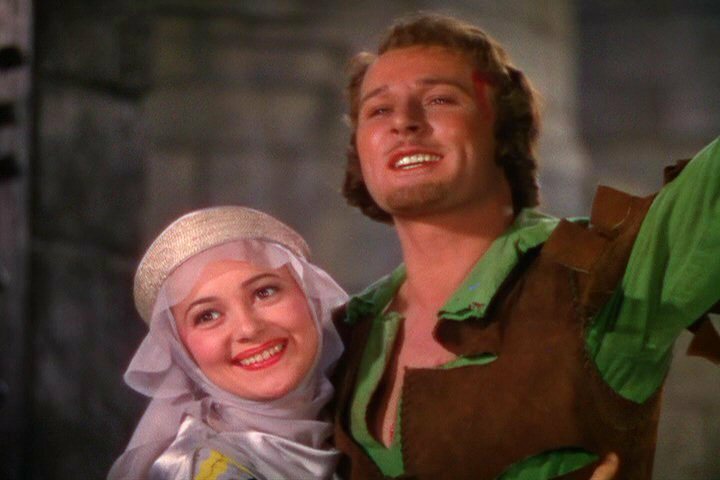 There were only two prominent roles for women in “The Adventures of Robin Hood”. Bess is the chaperone/female companion and servant to the Lady Marion. She is a wise older woman with a big romantic streak. She serves as comic foil and confidant at various points in the film. The dalliance she undertakes with Much after the banquet in the forest allows her to serve as a conduit between Marion in the castle and the band of outlaws. She is played by Una O’Conner, who pops up in Universal Horror movies and Warner Brother Costume dramas on a regular basis. Her bug eyes and memorable squeal make her a welcome comic addition to the story. Her accent and face made her feel very authentic in the Castle of Nottingham and in Sherwod Forest. Lady Marion Fitzwalter is the ward of King Richard. A Norman noblewoman who creates a Romeo and Juliet type love story by falling for the disgraced Saxon Knight Robin of Locksley. She is played by the luminescent Olivia De Havilland. It is hard to imagine but at one point, the screen writers were planning on this story without the character. The movie is a romantic look at the Robin Hood legends, but how romantic could it be if there was no romance. As of this writing, she is still alive and just three years away from reaching the age of 100. De Havilland is of course the one surviving member of the cast from this film and from Gone with the Wind. In her career she was nominated multiple times for the Academy Award and she won twice. She made eight films with Errol Flynn and you can see why when you watch this movie. Lots of stars have chemistry together, Tracy and Hepburn, Garbo and Gilbert, Redford and Newman. This was a pairing that puts all of them in the back seat. They look great together, she seems to look at him with the worshipful eyes that Ashley Wilkes was supposed to get. The great balcony scene that is clearly stolen from Shakespeare, gives her a chance to pour on the googly eyes and honey voice and Flynn responds like a snake charmed by the movement and sound of a flute. In her defiant speech to the court of execution, she gives dignity to other nobles who are not part of the Prince’s plot and she stands for equality between the Saxons and the Normans. I don’t think there has been a more attractive pairing of stars since, including Brad Pitt and Angelina Jolie. Robin Hood is a character out of English folklore, although there are similar tales told in other cultures. There are many versions of the character and they do not seem to be based on a single person. In college I took a history class entitled “Outlaws and Outcasts of the European Past”. I signed up in large part because Robin Hood was mentioned in the course description. Of course the historical information is a lot less romantic and the bits of history are inconsistent. That the story here works as well as it does is a reflection not only of character but of structure. The conflict between the Normans and the Saxons is not originally part of the legends, that is a contribution of the 19th century author Sir Walter Scott. It is used effectively here to create a sense of injustice not just from a heavy tax burden but from a sense of discrimination. That Marion is a Norman and Robin is a Saxon adds to the Romeo Juliet flavor of the story. Setting the story in the time of Richard The Lionheart has become a fixture of the Robin Hood films. This appears to be a sixteenth century addition to the legend but it works really well at allowing political intrigue to mix with the exploits of Robin. This film was released just ten years after talking pictures became the norm. The device of using title cards was not to far from the past. The movie opens with a card that announces the set up for the story. The story of swashbuckling adventure in outer space that opened in 1977 heavily borrowed from the past and a simple comparison of the story cards reveals how similar they are. 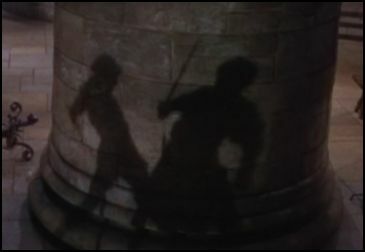 The film quickly establishes the characters of Robin and Sir Guy as adversaries. 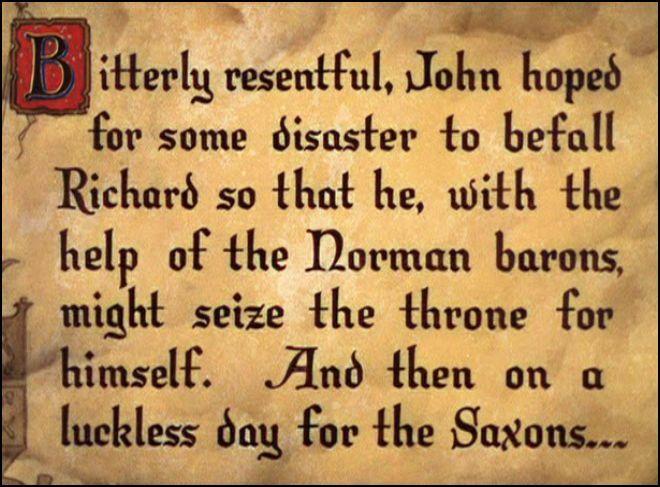 The plot to place John on the throne is hinted at in a banquet where the Norman barons are gathered. It is Robin himself that reveals the details. This shows that he is a sharp and observant thinker and his crashing of the feast sets the tone of jocular wordplay interspersed with daring escapes and fight scenes. This pattern is repeated several times in the story. Another pattern that comes up is the introduction of new characters through their interaction with Robin. Although the sequencing is quick, the structure might be a little repetitive, but the events are so well played and delightful that a couple of repetitions seems like a small price to pay. Ultimately, the plot comes to a boil and the outlaws manage to infiltrate the castle at Nottingham with the returned but disguised Richard, just in time to break up a coronation ceremony. 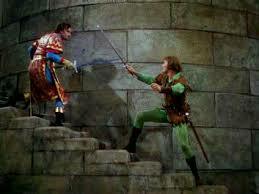 Robin and Sir Guy engage in an epic duel that sets the standard for screen swordplay. The duel is imaginatively shot and paced very effectively. Each man gets the upper hand at different points and the locations of the combat change throughout. Of course the war of words continues as well. 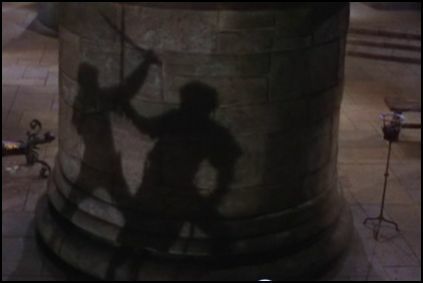 Robin consistently gets the better of Sir Guy with the one upsmanship dialogue.There is a terrific bit of business where the two combatants vanish from the frame but the duel continues in front of our eyes, magnified against a pillar wall in shadow. It is quite imaginative and effective as a moment of pure movie joy in this dramatic climax that we are witnessing. Michael Curtiz is listed as Co-Director, but most of the movie was shot by him. Apparently William Keighley, the other director, was not getting the action scenes done the way the producers had envisioned. Although they had had a successful outing in an earlier film, Keighley was replaced by Curtiz . Curtiz also had a successful history with Flynn, having directed him to stardom in “Captain Blood” and “The Charge of the Light Brigade”. Unfortunately his dictatorial style ruffled Flynn’s feathers and he was despised by his star. It appears that the feeling was mutual and Curtiz did not have much love for Flynn either. 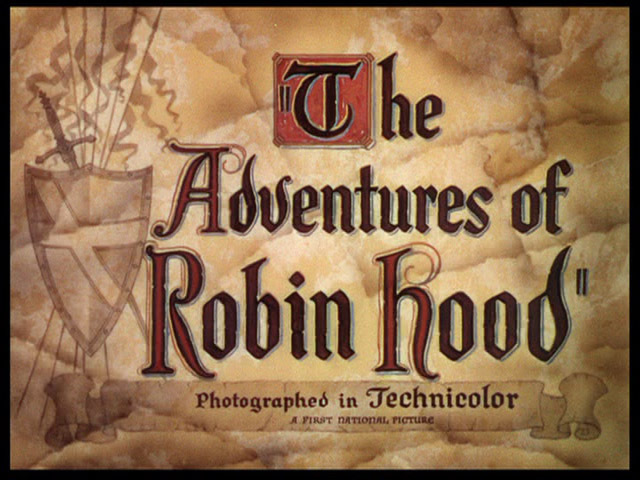 Even so, after the success of “The Adventures of Robin Hood”, they worked together on four more Warner’s pictures over the next three years. The very direct physical style that Curtiz used suited Flynn well and the action star was born on the big screen, breaking out of B movie melodramas and becoming a mainstream tradition. While the Saturday Serials may have influenced “Indiana Jones” style film making, it was the success of big budget movies like this which paved the way for careers of today’s action stars . Erich Wolfgang Korngold is the composer of the music to “the Adventures of Robin Hood”. He had come from Vienna to help his friend adapt Mendelson music to a film. For four years he made a variety of contributions to the invention of film scores. He had returned to Austria to conduct an opera when the offer came to score Robin Hood. He accepted and came back to Hollywood. Right after he left the areas of Austria he lived in were annexed by Nazi Germany. He later said that the film saved his life. As a Jew he would have been targeted for the usual treatment in Nazi occupied lands. His style is clasically romantic as you can hear if you play the video clip above. 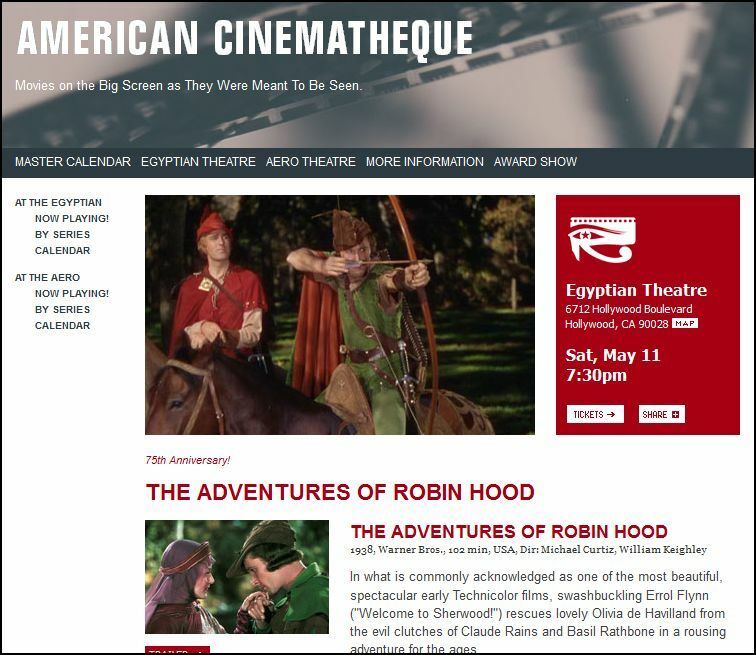 After the war he returned to classical composition, but many film scholars describe his score for “The Adventures of Robin Hood” as one of the greatest film compositions ever. The strutting melody that is played when Robin crashes the barons banquet is a great example of adapting themes to scenes. The lush romantic themes for Marion and Robin’s love scenes evoke a tenderness during turbulent times that promises a better day. 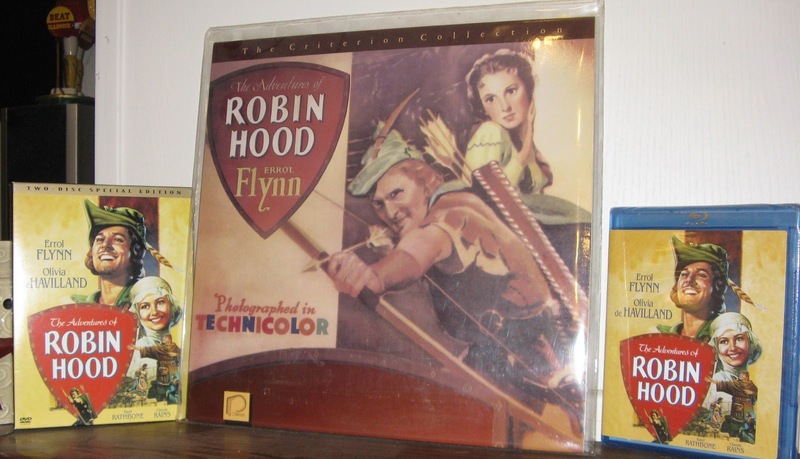 The Adventures of Robin Hood was one of the earliest films shot in Techicolor. In fact, they used all eleven existing Technicolor cameras for the shoot. The cameras were returned to Technicolor at the end of shooting each day. The film looks amazing, the greens are incredibly deep and the reds pop off the screen. The studio made full use of the technology and spent a huge amount of money to make the movie. It won the Academy Award for Art Direction and when you look at the sets you can easily understand why. I have a long history with the home versions of The Adventures of Robin Hood. A couple of years ago I donated all my VHS tapes to the Goodwill, so I do not have my purchased VHS version any more. I do have the copy I taped off of television in the early 1980s out in a box in the garage. I should dig it out, I’m sure it is an interesting artifact if it was done the way I think I remember doing it. There was a local station (KTLA) that ran movies in the evenings with only a couple of commercial interruptions. I usually let the commercials run out of gratitude for the limited breaks, so it will have some interesting TV history on it. I purchased my first Laser Disc player in 1990 and shortly after, invested in the Criterion Edition of the Laser Disc you see above. It has the original commentary track from film scholar Rudy Behmer that has been included on the DVD and Blu ray releases subsequently. Of course the movie plays regularly on TCM and every time I come across it, there goes another two hours of my life. 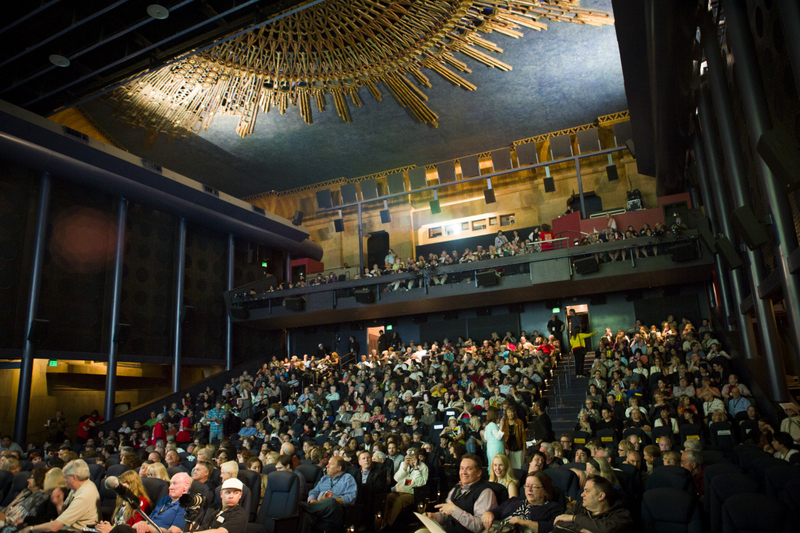 Last week my daughter and I went to a screening at the Egyptian Theater in Hollywood, hosted by the American Cinematheque. There were a couple hundred people there to share the experience. Several families came and they all seemed to be having as much fun as I was. We had a little trouble with the Fandango ticketing process but the screening was beautiful and the theater is in great shape. I should seriously consider joining the organization, I support what they do and the opportunities to see screenings like this would be greater. My only hesitation is that like a heroin addict, I’m afraid the entry level commitment is just the start. I can see myself easily moving into a theater seat there and not leaving. From a Screening of Mildred Pierce in the Week before our Robin Hood Adventure. 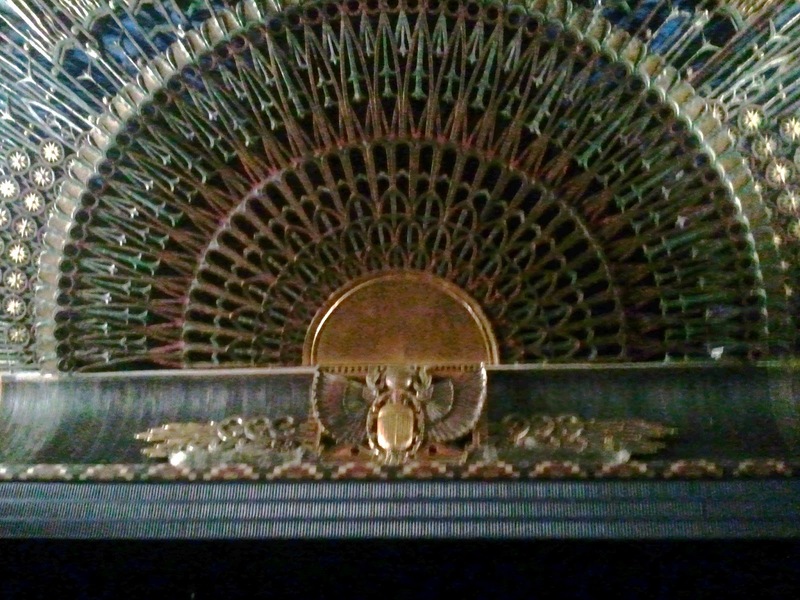 The ceiling decor at the Egyptian from our seats. 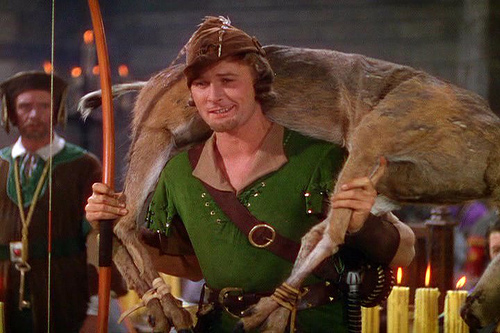 The Adventures of Robin Hood with Errol Flynn has been my favorite movie for forty years now. There are other movies that have been special and mean a lot to me but none has ever challenged the place in my heart that I hold for this treasure from the Glory Days of Hollywood. The last time I spent time around the backwaters of the Mississippi River, in a Southern Fried cultural slice of life picture, I suffered through the headache inducing “Beasts of the Southern Wild”. So it was with some trepidation that I approached this movie. Much of it seems centered around a backwoods river culture that is not really that appealing as a setting to me. I respect traditions and the hard work that it can take for a person to make it under those conditions, but it also seems to breed, at least in movies, a suspicion of outsiders and a tendency to be insulated. Fortunately, this film while having many of the characteristics I was worried about, also has some very sympathetic characters and the traditions seem to be respected for the values they impart, not just for the differences they evoke. This is a coming of age story that centers around the relationship of two fairly normal, rural river kids and a mysterious stranger. The man enters their lives, seeps into their consciousness, and drives their ultimate development, and maybe not always in the right ways. 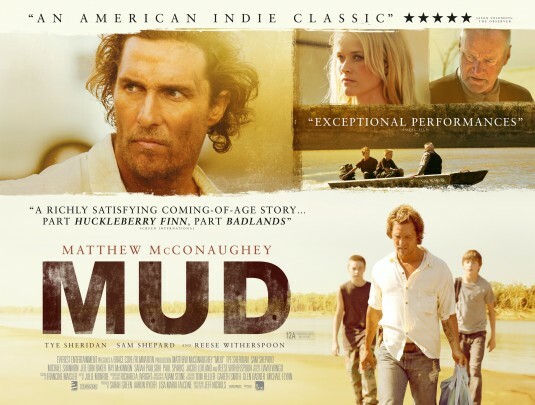 Matthew McConaughey plays the dangerous refugee named Mud. The character turns out to be just as familiar with the ways and people of the small town and surrounding areas as the two boys are. It turns out that while he is a stranger to them, he is not a stranger to their world. McConaughey gives a fantastic performance. His body language suggests confidence and superiority. At one point another character points out to the boys that they probably see him as a badass. While most of his physical demeanor might suggest that, his voice sometimes gives way to a sadness that allows us to see through the cracks. He is not always as certain of himself as he seems to suggest. His honey coated voice and corn pone manner of speaking are a disguise. One that is meant to convey power but often comes across like a kid embellishing the truth to make himself look a little better. McConaughey has always been trapped by his accent in his other roles. That may have masked the fact that his is a very competent actor. Here the accent fits the location and the character to a tee, and we get to focus on his performing gifts in an appropriate context. He runs with this part and makes Mud a compelling character that is maybe dangerously psychotic or achingly unfulfilled and yearning. Right now there are two names I am thinking about for Awards Season next winter, along with Harrison Ford in 42, McConaughey’s name will probably be whispered by some and shouted by others. The two kids are played by young men who are both perfectly cast and, at least at this point, show promise of a whole bunch of talent. Tye Sheridan has some acting experience, at least if you would call appearing in “The Tree of Life” acting. I don’t remember enough about him from that film, I do know he was not the main actor playing Sean Penn as a kid. In this movie he has a perfect mixture of guts, naivete, and sweetness to make him believable. The scenes where he woes an older girl with some success and failure are very honest and easy to identify with. His motivations are pure, even if his actions are not always well thought out. When his character Ellis, interacts with his parents it is with the awkward love that a young teen would have, complicated by the uncertainty that his family situation presents. We can understand completely why he would believe the things Mud tells him, and dream of making life’s wishes come true. His buddy Neckbone, is played by newcomer Jacob Lofland, and he is just a natural in the role. There may not be much technique in his acting because he basically plays a smart kid in a tough situation, who is making the best of it that he can. He plays the best friend like a real friend would act, and maybe that is the secret to casting child actors. Find a kid who really is the character they are playing. Everyone else in the movie gets some moments to shine as well. Michael Shannon has some great comic moments but also infuses the situation with a serious tone when he speaks to Ellis as the protective Uncle of his best friend. There may not be much subtlety to the metaphor that he presents to Ellis, but it sounds sincere and properly concerned. Ellis’ parents are both solid characters, living out an unpleasant reality while trying to keep their son on the straight and narrow path. Although they seem to approach the process in completely different directions, they are each trying to achieve the same goal. There are three other characters that figure prominently in the story. Sam Shepard gets a chance to shine as a neighbor who may know more about the events going on than anyone else. He looks much older in this part but his distinctive, flat voice carries the same authority it did in “The Right Stuff” thirty years ago. Joe Don Baker has made a living out of playing menacing big guys for nearly forty years. From good guys like the sheriff Buford Pusser in the original “Walking Tall” to the mob hit man tracking down “Charlie Varrick”, he has always been effective. When he shows up, you know that trouble has come to town. He doesn’t have much screen time but he makes the most of it. Also without a lot of screen time but showing herself to be the quality actress she is supposed to be is Reese Witherspoon. She is the trigger point for much of what happens on the screen, and she conveys the dangerously indifferent lover as world-weary and soft hearted at the same time. The echo of her behavior in Ellis’ life is again a little obvious, but it needs to be for him to learn from the events that unfold. The less said about the story the better. Not because it is bad but because it works so well and it will be more enjoyable if you experience it as it is revealed. There are some surprises but mostly we get an honest outcome of the dangerous relationship these boys have with the title character. Sure there are a couple of lucky coincidences, that is true in all stories. We see people living lives that seem so obviously wrong headed at times, but they just are these people’s lives and so it is normal for folks to miss the big picture at times. There is a morality in all of the lead characters that seems to come into conflict, so that it is not easy to say who is acting in the best way. We can clearly see however, that we want things to work out a certain way. That some of them do and some of them don’t is life. I am willing to say that at this moment, this is the best picture I have seen that has been released this year. It isn’t going to break the Memorial Day Box Office Record, it won’t win a dozen awards at the end of the year, but it will satisfy you as you watch it. You will thank me if you take my advise and go see this movie. If you were going to see it anyway, you may not thank me, but I bet you will agree with me. If anything in the following commentary makes any sense it will be something of a miracle. I’m writing this after seeing the film at an 11 pm screening, I did not get to bed until 2 am, and I woke up at my usual start time, 5:15 am. Basically, I’m cruising on left over adrenaline from the film, and that is a pretty good thing because the movie did get the juices going. The fuzziness will melt away as the day goes on, or else there will be a lot of confused people for the next 12 hours. The easiest way to put this is that the movie is very entertaing, and there are enough plot spoilers that I will have to be careful what I discuss. I deeply loved and admired the J.J. Abrams reboot of Star Trek from 2009. In my opinion it was the best film of that year. “Star Trek Into Darkness” will probably not earn that moniker by the end of 2013, but it is a nearly great film, and so far the most entertaining film of the year. The renewed crew of the Enterprise is sent on a secret mission to destroy a terrorist named John Harrison. The film begins with a completely unrelated action sequence, but it does set up some of the capabilities of the crew and reminds us of what an amazing ship the Enterprise is. There are two dramatic attacks by Harrison that set up the goal. In one of those attacks, Captain Kirk thwarts Harrison’s objective and he develops a strong motivation to see the terrorist brought to justice. The original Star Trek was a show about ideas first and action was a sideline. The new films recognize that deep philosophical discussions by the principles are not going to bring in an audience every few years for a movie. So the ethical and moral stakes that are behind the actions are often hidden or hinted at. There is only one scene where there is an outright focus on those kinds of moral judgments, and when it happens, you will be proud of the stubbornness of a certain Scottish engineer. It turns out that if he did not choose the path he travels, the rest of the plot and the crew of the Enterprise would not be making it out of this film. The relationship between Kirk and Spock is a more complex one in this new story dimension. Remember, this is a tentative friendship based on a limited amount of time. The jocular teasing that Shatner’s Kirk gave to Spock is repeated here, but the bonds of the friendship have not been tested much. This movie, despite all the action, and the political intrigue, and the plot line featuring the villain, is really about the nature of Kirk and Spock’s friendship. Each has expectations of the other and each is going to be disappointed early on in the story. Ultimately, the relationship is tested in a reversal of roles from the original Star Trek films plot lines. The way this is visualized and the touchstone nods to the original cast and past epic events is very well managed. Long time trekkers like me are going to laugh and cry over the spin that Abrams and the screen writing team have put together to entertain us. Those who are new to Trek may miss the echos from the other time line of stories, but they will still enjoy the resolution of those plot threads. And while all of that is happening, stuff crashes into the Earth, battles rage, fistfights against intimidating opponents and love stories, all wash over us. It takes a little while for the movie to get it’s sea legs, but once the action moves to the Klingon home world of Kronos, the film hits it’s stride and the dramatic events feel a lot more synchronized than they do in the first third of the film. Benedict Cumberbatch plays the mysterious and extremely dangerous Harrison. This character turns out to be a lot more complex than we are originally lead to believe, although the fan community probably feels they have everything figured out ahead of time. When I was younger I sought out every piece of information I could find on upcoming films, I wanted to be an insider. These days I try to keep the spoiler information to a minimum, because I want the movie experience to be what seeing the film is all about. There will definitely be expectations about what takes place if too much is revealed about Cumberbatch’s character. He has a passive but menacing face that suggests indifference to human concerns. His voice operates in a very controlled range but with enough inflection to convey ideas and feelings. At the end of the year, it is that voice that will largely determine how i feel about the second Hobbit film, because he is the voice of Smaug, the dragon. Peter Weller brings his talents to the film as well. He plays a politically astute Admiral in Star fleet, who sends Kirk on his mission, and he has an agenda as mystifying as Harrisons. The parallel universe in this Star Trek series means that characters from the other timeline will be a part of the story but that their paths may not always play out in the same ways. I was happy to see a new character introduced to this timeline, and she may be a key figure in future Star Trek stories. If you hated J.J. Abrams predilection for camera flare before, get ready to have your head explode because he goes overboard on those shots in this film. The camera is very active in the action scenes but I did not experience any of the nausea that usually comes with “shaky cam” techniques. The scenes of gravity induced panic and upheaval are well staged and the camera manages to follow events pretty well. Zachary Quinto and Chris Pine play their big scene just right toward the climax of the film. It carries the emotional wallop that you want a Star Trek film to contain. All of the usual characters get a moment or two to shine. Simon Pegg especially as Scotty, since his plot elements end up turning the tables at a key moment. I do feel that some elements don’t quite gel in the first hour. There are some scenes that go on a while longer than necessary and the comradeship between the characters on the Enterprise is still taking it’s time to develop, but i really want to get to the next movie to see how all of that is going to happen. Star Trek Into Darkness feels like the first act in a play that you want to move forward in so you can see what happens next. This is my favorite film of all time and I am planning a long post on it in the near future. I just wanted to say for the moment how wonderful it looked on the Big Screen at the Egyptian Theater in Hollywood. There were a couple of hundred people there to see a classic film in a classic setting. I am so spoiled, within eight days I got to see my two favorite films in their natural surroundings, a movie theater. This is Mother’s Day and so we have been occupied with other events, but I have a thought that I want to share with any other bloggers out there who might be interested. Tuesday marks the 75th Anniversary of this treasure from the Golden Age of Hollywood. I’d like to do a blog bomb on the film this month. If I could get a dozen bloggers willing to commit to a date sometime before June, I thought it might be fun for all of us to post on our sites the same day. I have a few loyal readers but not as many active blog writers as I might like to have for this project. If you could share this with anyone on your site who might be interested, I would appreciate it. I will make some requests at sites I frequent but maybe others of you could find someone that loves “The Adventures of Robin Hood” and would like to participate. Ask them to contact me at kirkham007@gmail.com . When I have a dozen ready to launch, I’ll set a date and we can all enjoy the results. I will be happy to post links to all blog posts submitted here on my site and I hope everyone else will do so as well. I hope to hear from some of you soon. Thanks. 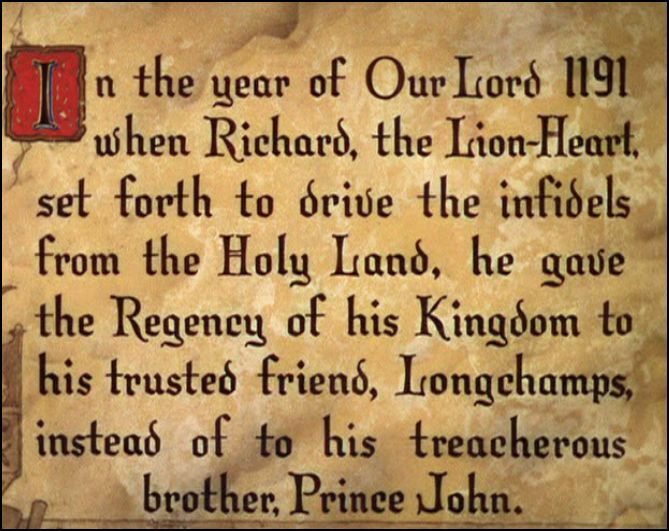 In the year of Our Lord 1191 when Richard, the Lion-Heart, set forth to drive the infidels from the Holy Land, he gave the Regency of his Kingdom to his trusted friend, Longchamps, instead of to his treacherous brother, Prince John.